Many coaching manuals refer to players having a game plan when they enter the court prior to the match. Well that’s all very well if you are familiar with the strengths and weaknesses of the opponent, but what if this is a friend of a friend, or a work colleague or club member that you haven’t encountered before? The answer, naturally, is to “feel them out”. That process of taking apart your opponent’s game and analysing it starts before you’ve even got on court. The locker room: it has a culture all of its own, and can be as unforgiving as any squash court. It’s political, bitchy, and below the surface of seemingly sociable chat, you’ll find manipulation aplenty. And that’s how you want to approach the first encounter with this new playing partner of yours. Ask them seemingly innocuous questions such as how frequently they play, and what type of racket or grip they use. All very innocent, but the answers may give a clue as to what you are up against. The same is true of the knock-up. Again, you’re innocently going through the process of warming up the ball prior to the match. But the odd forehand or backhand to your opponent’s right or left may give clues as to where best to probe once battle is joined. Don’t forget of course that he or she will be doing exactly the same. The advantage will lie with the player who makes the best of their powers of observation. This process of probing for strengths and weaknesses should continue during the early stages of match play, if only to double check that there wasn’t a little kidology at work during the warm-up. You can be sure that your opponent will be trying to move you around the court, attempting to gain an early psychological advantage as well as a physical one through upping your work rate. Attempt the same yourself, mixing up your stroke play in order that you don’t become too predictable. Forehands and backhands to the back of the court will put you in the driving seat and be demoralising for the opponent while volleys will give him or her little or, hopefully, no time to play a decent shot. If, on the other hand, the pressure is building on you, then try a lob or two to take the heat off and allow time to mentally and physically recover from the onslaught.If you have got your tactics spot on and allied them to good technical execution, then the climax of the match should see you polishing off a tired and thoroughly beaten opponent. Well, that’s the theory anyway. In practice, matches can be very tight affairs so good mental discipline should be added to that checklist of winning habits. Whether you have won or lost, always remember to take time after the match to analyse what happened on court. Where could you have been stronger? If you were on the wrong end of the score line, where did your opponent gain the advantage and how did he do it? 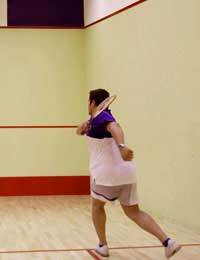 Good squash players never think they know it all. Each match is a learning experience to be absorbed and used in a positive manner to produce a better performance when next they step out on court. Make sure that you do the same, and you’ll guarantee many more good days than bad.